I love the idea of giving this as a homemade holiday gift. It’s incredibly yummy, unique and inexpensive to put together. If you have a chai and ice cream lover in your life they will love this! Pour this on top of some old-fashioned vanilla ice cream, sit back and swoon over the first bite. Heaven in a bowl. Also, do not take my lead on wrapping here, this picture does not show how I am going to package this gift. Instead, place syrup in a cute ice cream bowl and tie an ice cream scoop to the outside of the cellophane. It looks so cute this way! For the bare minimum, cut a festive round circle out of fabric and tie on the top of the jar with some raffia and serving instructions. This is also great to serve at parties. When it comes to entertaining, sometimes we don’t always have time to make the big dessert. Simple ice cream with an a lovely sauce is the perfect end to any meal. Just make sure to but the best ice cream in your budget, it also makes a difference. I promise you everyone will love it. 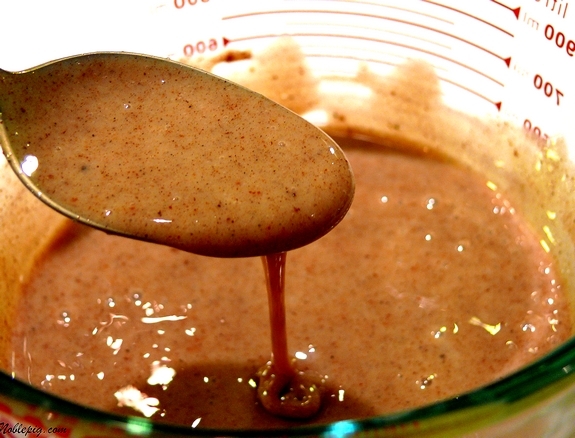 In a medium-sized pouring vessel, such as a Pyrex measuring cup, add sweetened condensed milk, sugar, cardamom, cinnamon, cloves and nutmeg. 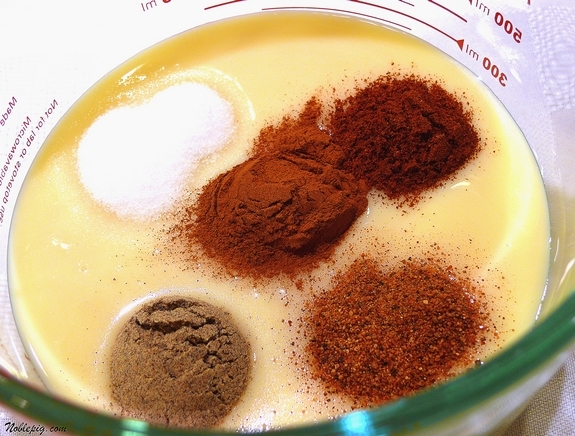 In a medium-sized pouring vessel, such as a Pyrex measuring cup, add sweetened condensed milk, sugar, cardamom, cinnamon, cloves and nutmeg. Mix until combined. Store in the refrigerator. To use: Pour over vanilla ice cream, it’s absolutely delicious. Keep refrigerated. 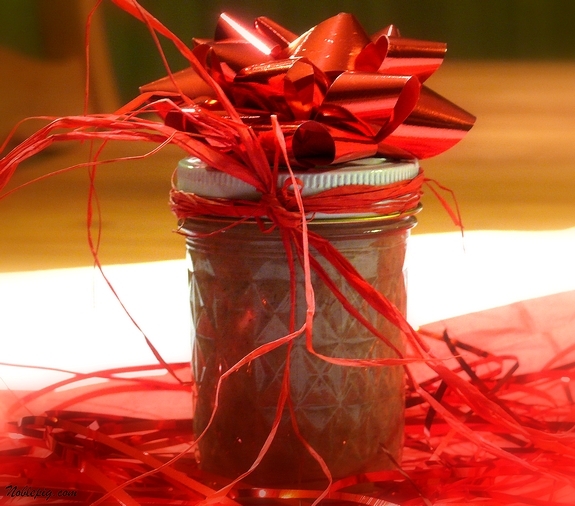 To give: Pour into small jars (I used half pint jars, all but about 2 Tablespoons did not fit in this size jar) with lids and package decoratively. Attach a tag with instructions to keep the mix refrigerated and how to use it. Placing in a ice cream bowl, wrapped in cellophane with an ice cream scoop attached is the cutest. I LOVE this! I am definitely going to make some for gifts AND for me! I am loving all your gift ideas! Keep ’em coming. This looks and sounds delicious. I am going to try this. My son just moved to Bakersfield, California from Georgia. Do you think he is going to like it!! I love your blog! I’m going to try it . It sounds great and I love the idea of using it with ice cream. I have just the person to give it to. Great gift idea! Easy for me to make, and so many possibilities for wrapping. Thanks for this one. You are a genius! I cannot wait to try it. Do you have to keep it refrigerated? This is very tempting to start me back on making gifts prepared lovingly fom my home to yours. I think I know who I’ll be gifting this to. That’d be me…I love chai! What a cool gift idea. I have people who love the tea route and others for the ice cream route. I am going to make some up. Thanks for all these ideas! This is great, because I LOVE chai, but I can no longer have caffeine (migraines, ugh), so I had to give it up. Now I can keep this on hand with some decaf tea bags! Cannot wait to drink your wine. Do you have my address??? Can I be on your Christmas list??? This is STUNNINGLY AWESOME, and I am so adding it to my canned gifts this year. I’ve never had Chai before and this sounds so yummy, not to mention festive. I think my mom and sister really like it and this is just the thing to send! This is now on my gift list. Looks fantastic! I think this would go all over some ice cream – or maybe even some apple pie… making me hungry! Can I give this to ME??? Oh. My. Word. I am so totally making this next week–just have to go into McMINNVILLE to do grocery shopping on Monday. DH and I will drink this up, literally. I really enjoy your blog, especially b/c I’m right in Newberg and it’s so fun hearing about places I know of. As a teenager I babysat for several families who were involved in winemaking and other local foods, so what you’re doing is near to my heart. I’ve watched vineyard space grow exponentially over the past 25 years–including right in my growing-up “backyard” in the Red Hills (think Russell Fuqua and Allen & Sally Holstein). So glad you’re here and loving it! I just bought four cans of condensed milk at Costco. Now I know what I will do with them! Thank you for this recipe – it’s such a great idea and I have many chai lovers who would adore this as a gift. Perfect and simple. The recipe looked so amazing I had to try it. A half teaspoon of peppermint extract added an extra holiday touch. I love anything I can serve on ice cream! This is a stellar idea! I have never tried Chai Tea…I think I must and maybe after trying it I might decide to try this. I like the ideas for gift wrapping items for tea lovers. Wow – super idea. Can’t wait to try it. Who would have thunk? Since canned sweetened condensed milk is one of the tastiest inventions of last century, how can you go wrong with this recipe. Su-WEE, uh I mean Su-weet! This is such a nice idea! I just love Chai, it’s so warm and inviting. What an awesome idea Cathy! I am making homemade baskets for my co-workers – including my homemade mustard and hot chocolate mix – I may have to add this to the bunch! BLESS YOU! Chai tea is my absolute favorite and I am getting tired of paying so much for the store bought concentrates! Once again, YUM! I would have never thought of this but it is a great gift idea. Ooh I have a few friends who would love to receive this treat. Thanks. Love the spiced cider sachets too! I love this idea! I’m using it!! I buy that chia tea concentrate and it’s not cheap. I’m trying this tomorrow! Gave it a Stumble too! can some one give me tips on making of jelly ice-cream. I guess that to receive the mortgage loans from banks you should present a great reason. Nevertheless, once I’ve got a bank loan, just because I was willing to buy a house. I just loved that! With coffee and tea it’s simply divine! My husband was eating out the rests with a spoon like a kid! :-) Thank You for the recipe!! What a great idea! The perfect accompaniment to a prettily wrapped tin of snickerdoodles! !